To Cite: Xu X, Zhang X , Zhang S , Feng Z . Bone Marrow Mesenchymal Stem Cell with Up-Regulation of MicroRNA-206 in the Treatment of Bronchopulmonary Dysplasia in Newborn Mice, Iran J Pediatr. Online ahead of Print ; 29(3):e11121. doi: 10.5812/ijp.11121. Background: Bronchopulmonary dysplasia (BPD) is a chronic lung disease of preterm neonates with a few therapeutic options. Our previous studies suggested that bone marrow-derived mesenchymal stem cell (BMSC) therapy is effective in the treatment of BPD in mouse models. Furthermore, microRNA-206 (miR-206) suggested having a correlation with BPD by regulating the expression of fibronectin 1 (FN1). Objectives: The aim of this study was to characterize the role of BMSCs with the up-regulation of miR-206 in the treatment of BPD in newborn mice. Methods: The BPD mouse model was induced by 60% oxygen. BMSCs transfected with miR-206 or negative control (NC) plasmid were administered on postnatal day 7 (P7) and every following week through an intraperitoneal injection (105 cells/animal) until P35. The mice were weighed and their lungs were weighed and prepared for histology. The expression levels of miR-206, FN1, and pulmonary surfactant-associated protein-C (SP-C) were determined through the quantitative polymerase chain reaction and under the immunofluorescence. The protein expression levels of transforming growth factor-β1 (TGF-β1) and interleukin-6 (IL-6) were determined by ELISA. Results: BMSCs with up-regulation of miR-206 reduced the degrees of pulmonary edema, improved pulmonary architecture, and attenuated inflammation in BPD mice compared to the NC plasmid group. Furthermore, the up-regulation of miR-206 in BMSCs down-regulated the expression levels of TGF-β and IL-6 in plasma samples and of SP-C and FN1 in the lung tissue of BPD mice. Conclusions: BMSCs with up-regulation of miR-206 are effective in the treatment of BPD in newborn mice, and the study introduced a novel idea for the treatment of BPD. Bronchopulmonary dysplasia (BPD) is a chronic lung disease of preterm neonates. It is primarily characterized by persistent abnormalities of the lung structure and arrested lung development, e.g., impaired alveolar and vascular growth (1, 2). Despite advances in perinatal care, BPD remains a major cause of neonatal morbidity and mortality, and there are now a few therapeutic options for patients with BPD. Our previous study verified the therapeutic efficacy of bone marrow-derived mesenchymal stem cells (BMSCs) in the hyperoxia-induced BPD mouse model (3). 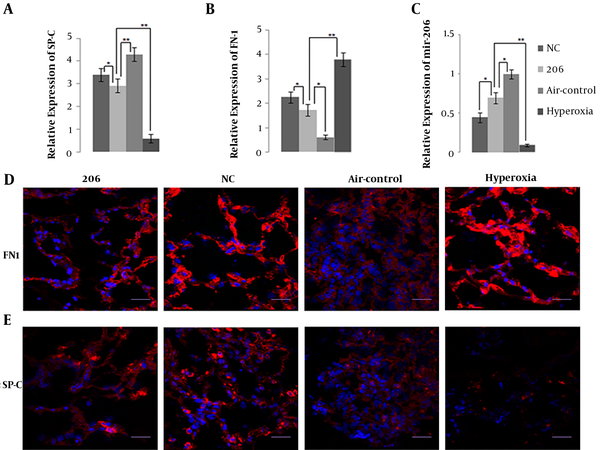 BMSC delivered intraperitoneally can target injured lungs, improve pulmonary architecture, attenuate pulmonary fibrosis, and decrease pulmonary expression of a number of genes related to extracellular matrix (ECM) remodeling and fibrosis, e.g., transforming growth factor-β1 (TGF-β1), collagen 1a and tissue inhibitor of metalloproteinases-1, interleukin-1 (IL-1), and tumor necrosis factor-α (3, 4). This conclusion is consistent with the results of previous studies (5-11) and the data support that stem cell therapy is feasible. MicroRNAs (miRNAs or miRs) are 21 - 25-nucleotides long non-coding RNAs involved in various biological processes, e.g., cell proliferation, cell death, stress resistance, and tumorigenesis (12, 13). Our previous study verified that microRNA-206 (miR-206) contributes to the pathogenesis of BPD by regulating the expression of fibronectin 1 (FN1). In the development of BPD, miR-206 is down-regulated in BPD patients and newborn mice, and targets FN1, an ECM glycoprotein involved in cell adhesion and migration, e.g., embryogenesis, wound healing, metastasis, and host defense (14). To study the interaction between BMSCs and miR-206 in the treatment of BPD, this study investigated the effect of BMSCs with up-regulation of miR-206 in a well-established hyperoxia-induced model of BPD by regulating BMSCs transfected with miR-206 intraperitoneally. As previously described (15), BMSCs were obtained from the femoral bone marrow of mice (Kunming mice, 3 - 4-week-old males, purchased from the Chinese Academy of Sciences, Beijing, China). The analysis of cell surface immunophenotype suggested that the BMSC population was positive for cluster of differentiation 105 (CD105) and CD106 but negative for CD34 and CD45. The plasmids of mmu-miR-206 (miR-206) and miRNA-shNC (NC) were purchased from GenePharma (Shanghai, China). Transfections were performed using a Lipofectamine™ 2000 kit (Invitrogen Life Technologies, Carlsbad, CA, USA) following the manufacturer's instructions and our previous study (3). Cells (1 - 3 × 106 per well) grown to a confluency of 50% - 60% in 10-cm Petri dishes were transfected with different double-stranded miRNA mimics, siRNA sequences (600 pmol; GenePharma), or their associated mock sequences. The cells were harvested at 48-h post-transfection. Total RNAs were purified with the mirVana™ PARIS™ kit (Ambion Life Technologies, Carlsbad, CA, USA). A One-Step SYBR PrimeScript RT-PCR kit (Takara Bio, Inc., Tokyo, Japan) was employed to quantify the copy number of cDNA targets (16). All the animals for experiments were approved by the Hospital of Beijing Institutional Animal Care and Use Committee (Beijing, China) and consistent with the guidelines of the National Institutes of Health concerning the care and use of laboratory animals. The experimental BPD mouse model was induced as previously described (17). Newborn Kunming mice (Chinese Academy of Sciences) were placed in sealed Plexiglas chambers and exposed to hyperoxia (60% FiO2) from birth. Newborn mouse pups were assigned randomly to one of the four groups: (i) Normoxia (room air, air control group), (ii) hyperoxia plus phosphate-buffered saline (hyperoxia group), (iii) hyperoxia plus BMSCs transfected with negative control (NC) group, and (iv) hyperoxia plus BMSCs transfected with miR-206 (206-group). Each group was composed of six mice. The cells were administered on postnatal day 7 (P7) through an intraperitoneal injection (105 cells/animal) and every following week. The animals were euthanized with intraperitoneal sodium pentobarbital on P35. On P35, the mice were anaesthetized with 50 mg/kg sodium pentobarbital. Blood samples were collected from the orbital sinus, and plasma samples were snap-frozen in liquid nitrogen for later analysis. The lungs were weighed and prepared for histology (17). The lung coefficient (weight of lung/mouse weight) was adopted to compare the degrees of pulmonary edema in each group. Radial alveolar counts (RAC) were also performed as previously described (17). Mouse lung tissue samples were incubated with a rabbit polyclonal anti-FN1 antibody (no. 15613-1-AP; Proteintech Group Inc., Chicago, IL, USA) and anti-pulmonary surfactant-associated protein-C (SP-C; SC-13979 lot no. C3111) antibody at a dilution of 1:50 as the primary antibody (16). A goat anti-rabbit immunoglobulin G conjugated with fluorescein isothiocyanate (no.88370, detection for cells; Jackson Immuno Research Laboratories, Inc., West Grove, PA, USA) served as the secondary antibody at a dilution of 1:200. The samples were counterstained with Hoechst 33258 and photographed under a confocal microscope (Nikon C1Si; Nikon, Tokyo, Japan). Plasma activities of interleukin-6 (IL-6) and TGF-β1 were examined using appropriate ELISA kits (Neobioscience Technology Co.Ltd., Beijing, China). Data were presented as the means ± standard deviation of the samples. One-way analysis of variance and the least significant difference test were conducted to compare the differences. P < 0.05 means a statistically significant difference. BMSCs were transfected with the miR-206 or NC plasmid. After 48-h post-transfection, the expression level of miR-206 was detected in BMSCs transfected with the miR-206 or NC plasmids by qPCR. The results suggested that compared with BMSCs transfected with the NC plasmid, the BMSCs transfected with miR-206 significantly up-regulated the expression of miR-206 in BMSCs (Figure 1). Figure 1. The relative expression level of microRNA-206 (miR-206) in bone marrow-derived mesenchymal stem cell at 48-h post-transfection detected using quantitative polymerase chain reaction. Abbreviation: NC, negative control. During the experiment, one mouse in the hyperoxia control group died on P32, while the other experimental animals survived. In comparison with the air control group, the BPD mice on P35 had a lower body weight (Figure 2A) and higher lung coefficient (Figure 2B). Figure 2A and B show that BMSCs transfected with the miR-206 or NC plasmid to a certain extent could increase mice weight and decrease the lung coefficient. Mice in the 206-group were heavier with a lower lung coefficient compared with those in the NC group. Through the histological analysis and quantification using RAC, it was observed that intraperitoneal delivery of BMSCs (for BMSCs transfected with miR-206 and with NC plasmid) improved alveolarization compared to the hyperoxia controls (Figure 2C and D). BMSCs transfected with miR-206 were more efficient compared to the BMSCs with the NC plasmid. The comparison between the BMSC-treated group and hyperoxia control group suggests that the BMSCs transfected with the miR-206 or NC plasmid had potential therapeutic benefits in treating BPD. Figure 2. A, Weight of the mice; B, pulmonary coefficient of the mice; C, histological analysis of the lung tissue (scale bar, 100 mm) and D, radial alveolar counts for the four different groups on postnatal day 45. * P < 0.05, ** P < 0.01. Abbreviations: NC, negative control; 206, microRNA-206. The mRNA expression level by qPCR and protein expression level by immunofluorescence of SP-C, a specific marker of alveolar type II epithelial cell (AEC II) identity that is related to BPD, in BMSC-treated mice lung tissue were significantly higher than in the hyperoxia control group (Figure 3A and E). Obviously, BMSCs transfected with miR-206 down-regulated the expression of SP-C compared to BMSCs with the NC plasmid. Figure 3C shows that intraperitoneal delivery of BMSCs up-regulated the expression level of miR-206 in mice lung tissue, and miR-206 in the 206-group had higher pulmonary expression level than in the NC group, suggesting that BMSCs transfected with miR-206 up-regulated the expression of miR-206. Figure 3. 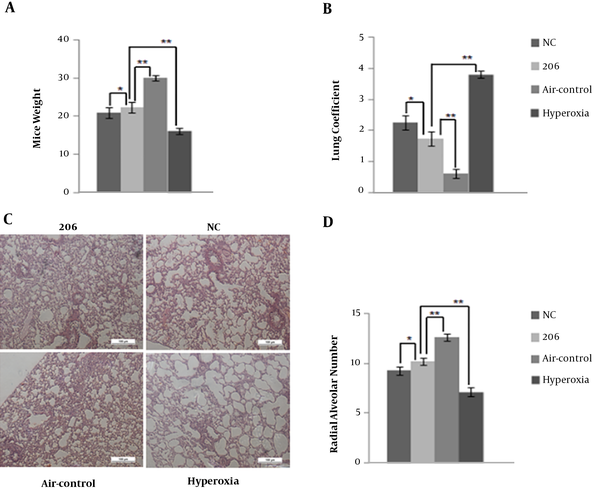 A, Detection of pulmonary surfactant-associated protein-C (SP-C); B, fibronectin 1 (FN1) and C, microRNA-206 (miR-206) expression in the mice lung tissue of the four groups by quantitative polymerase chain reaction; D, Expression of FN1 and E, SP-C in the mice lung tissue of the four groups by immunohistochemical staining; bars represent 20 μm. * P < 0.05, ** P < 0.01. Abbreviation: NC, negative control. Figure 3B and D show that intraperitoneal delivery of BMSCs down-regulated the expression of FN1 transcriptionally and translationally in BPD mice lung tissue, and BMSCs transfected with miR-206 reduced the expression of FN1 compared to the BMSCs with the NC plasmid. The plasma expression levels of IL-6 and TGF-β1 were lower in the BMSC-treated group than in the hyperoxia control group (Figure 4A and B). In comparison with the BMSCs transfected with the NC plasmid, the BMSCs transfected with 206 down-regulated the plasma expression levels of IL-6 and TGF-β1. It appears that BMSCs may exert their therapeutic benefits by reducing the expression levels of inflammatory cytokines (FN1, IL-6, and TGF-β1). Figure 4. 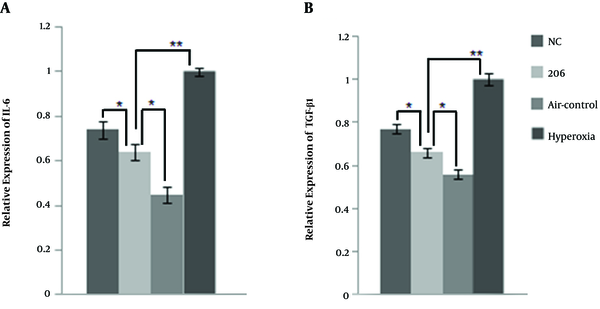 A, Relative expression levels of interleukin-6 (IL-6) and B, transforming growth factor-β1 (TGF-β1) in the mice plasma of the four groups using the ELISA method. * P < 0.05, ** P < 0.01. Abbreviations: NC, negative control; 206, microRNA-206. This study verified that BMSCs transfected with miR-206 or with the NC plasmid have potential therapeutic benefits in treating BPD by reducing the degrees of pulmonary edema, improving alveolarization, up-regulating the expression level of SP-C, and reducing the gene expression levels of inflammatory cytokines (Fn1, TGF-β1, and IL-6). miR-206 is related to the diagnosis, treatment, and prognosis of various types of disease, e.g., lung cancer, colorectal cancer, gastric cancer, breast cancer, and osteosarcoma (18-22). The down-regulation of miR-206 and the up-regulation of FN1 observed in patients with BPD and BPD mice are important in ECM remodeling and contribute to the progression of BPD. 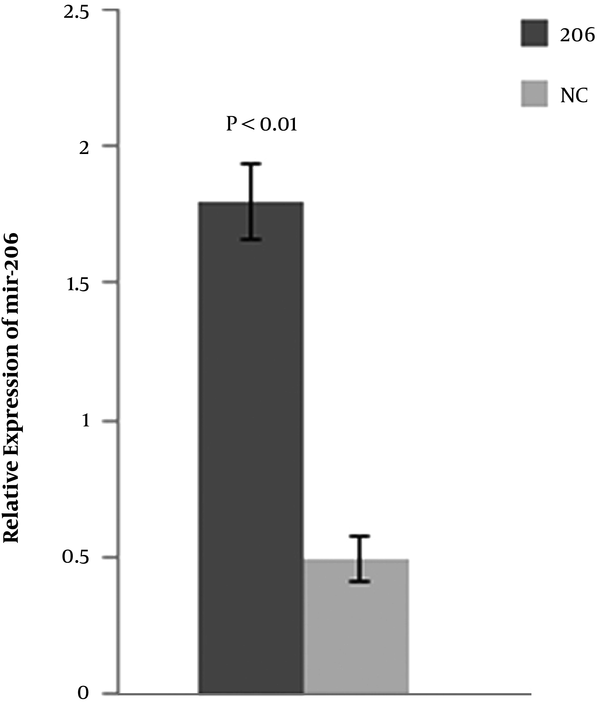 miR-206 overexpression significantly induced cell apoptosis. It reduced cell proliferation, migration, and adhesion abilities, as well. However, this study found that BMSCs with up-regulation of miR-206 down-regulated the expression of SP-C transcriptionally and translationally compared to the BMSCs with the NC plasmid. This result was also reported by Zhang et al. (23); miR-206 regulates lung surfactant secretion by limiting the availability of vesicle-associated membrane protein-2 (VAMP2) protein. The SP-C is a specific marker of AEC II with a correlation to the development of BPD (24). The down-regulation of SP-C in the lung tissue does not improve the treatment of BPD. Regardless that, BMSCs with up-regulation of miR-206 are more efficient in reducing the degrees of pulmonary edema and pulmonary expression of a number of genes (FN1, TGF-β1, and IL-6) involved in ECM remodeling and fibrosis compared to the BMSCs with the NC plasmid. FN1, TGF-β1, and IL-6 are important for the development of BPD. FN1 is considered to be induced by inflammation (25, 26) and numerous studies have linked the inflammation with an increase in BPD (27, 28). Inhibition of TGF-β1-reduced inflammation and apoptosis may gain insights into the development of potential therapeutic strategies targeted against BPD (29). IL-6 can serve as the independent predictive cytokines of BPD (30). Accordingly, these data support the notion that the inhibition of gene expression levels of inflammatory cytokines (FN1, TGF-β1, and IL-6) improves the treatment of BPD. In general, BMSCs with up-regulation of miR-206 are more beneficial in the treatment of BPD compared to the BMSCs with the NC plasmid. The inhibition of the inflammatory cytokine (Fn1, TGF-β1, and IL-6) gene expression levels may be important for the treatment of BMSCs with the up-regulation of miR-206. This study also revealed that BMSCs transfected with miR-206 increased the expression level of miR-206 and decreased the expression of FN1 in BPD mouse lung tissue compared to the BMSCs with the NC plasmid, which is more beneficial in treating BPD. This suggested that BMSCs might act as a miR-206 vector in the BMSCs with up-regulation of miR-206 in the treatment of BPD. In addition, compared to the hyperoxia control group, BMSCs transfected with the NC plasmid up-regulated the expression level of miR-206. Whether the therapeutic effect of BMSCs is partially achieved by up-regulating the expression of miR-206 or not needs further investigation. This study provided a novel idea for the treatment of BPD, and miR-206 may become a new target in the treatment of BPD in the future. This study was supported by the National Natural Science Foundation of China (81170602, 81270059). Authors' Contribution: Individual author contributions to the manuscript: Literature search: Xiaojun Xu; data collection: Xiaojun Xu; study design: Xiaoying Zhang; analysis of data: Shen Zhang; manuscript preparation: Xiaojun Xu;&nbsp; review of manuscript: Zhichun Feng. Ethical Considerations: All experiments were approved by the Hospital of Beijing Institutional Animal Care and Use Committee (Beijing, China) and consistent with the guidelines of the National Institutes of Health concerning the care and use of laboratory animals. Financial Disclosure: There are no financial disclosure. Funding/Support: This study was supported by the National Natural Science Foundation of China (81170602, 81270059). 1. Baker CD, Ryan SL, Ingram DA, Seedorf GJ, Abman SH, Balasubramaniam V. Endothelial colony-forming cells from preterm infants are increased and more susceptible to hyperoxia. Am J Respir Crit Care Med. 2009;180(5):454-61. doi: 10.1164/rccm.200901-0115OC. [PubMed: 19483112]. [PubMed Central: PMC2742761]. 2. Balasubramaniam V, Mervis CF, Maxey AM, Markham NE, Abman SH. Hyperoxia reduces bone marrow, circulating, and lung endothelial progenitor cells in the developing lung: Implications for the pathogenesis of bronchopulmonary dysplasia. Am J Physiol Lung Cell Mol Physiol. 2007;292(5):L1073-84. doi: 10.1152/ajplung.00347.2006. [PubMed: 17209139]. 3. Zhang X, Wang H, Shi Y, Peng W, Zhang S, Zhang W, et al. Role of bone marrow-derived mesenchymal stem cells in the prevention of hyperoxia-induced lung injury in newborn mice. Cell Biol Int. 2012;36(6):589-94. doi: 10.1042/CBI20110447. [PubMed: 22339670]. 4. Chang YS, Ahn SY, Yoo HS, Sung SI, Choi SJ, Oh WI, et al. Mesenchymal stem cells for bronchopulmonary dysplasia: Phase 1 dose-escalation clinical trial. J Pediatr. 2014;164(5):966-972 e6. doi: 10.1016/j.jpeds.2013.12.011. [PubMed: 24508444]. 5. Chang YS, Oh W, Choi SJ, Sung DK, Kim SY, Choi EY, et al. Human umbilical cord blood-derived mesenchymal stem cells attenuate hyperoxia-induced lung injury in neonatal rats. Cell Transplant. 2009;18(8):869-86. doi: 10.3727/096368909X471189. [PubMed: 19500472]. 6. Chang YS, Choi SJ, Sung DK, Kim SY, Oh W, Yang YS, et al. Intratracheal transplantation of human umbilical cord blood-derived mesenchymal stem cells dose-dependently attenuates hyperoxia-induced lung injury in neonatal rats. Cell Transplant. 2011;20(11-12):1843-54. doi: 10.3727/096368911X565038. [PubMed: 23167961]. 7. Chang YS, Choi SJ, Ahn SY, Sung DK, Sung SI, Yoo HS, et al. Timing of umbilical cord blood derived mesenchymal stem cells transplantation determines therapeutic efficacy in the neonatal hyperoxic lung injury. PLoS One. 2013;8(1). e52419. doi: 10.1371/journal.pone.0052419. [PubMed: 23349686]. [PubMed Central: PMC3549907]. 8. van Haaften T, Byrne R, Bonnet S, Rochefort GY, Akabutu J, Bouchentouf M, et al. Airway delivery of mesenchymal stem cells prevents arrested alveolar growth in neonatal lung injury in rats. Am J Respir Crit Care Med. 2009;180(11):1131-42. doi: 10.1164/rccm.200902-0179OC. [PubMed: 19713449]. [PubMed Central: PMC3269236]. 9. Aslam M, Baveja R, Liang OD, Fernandez-Gonzalez A, Lee C, Mitsialis SA, et al. Bone marrow stromal cells attenuate lung injury in a murine model of neonatal chronic lung disease. Am J Respir Crit Care Med. 2009;180(11):1122-30. doi: 10.1164/rccm.200902-0242OC. [PubMed: 19713447]. [PubMed Central: PMC2784417]. 10. Abman SH, Matthay MA. Mesenchymal stem cells for the prevention of bronchopulmonary dysplasia: Delivering the secretome. Am J Respir Crit Care Med. 2009;180(11):1039-41. doi: 10.1164/rccm.200909-1330ED. [PubMed: 19923401]. 11. Luan Y, Ding W, Ju ZY, Zhang ZH, Zhang X, Kong F. Bone marrow-derived mesenchymal stem cells protect against lung injury in a mouse model of bronchopulmonary dysplasia. Mol Med Rep. 2015;11(3):1945-50. doi: 10.3892/mmr.2014.2959. 12. Cheng J, Zhou L, Xie QF, Xie HY, Wei XY, Gao F, et al. The impact of miR-34a on protein output in hepatocellular carcinoma HepG2 cells. Proteomics. 2010;10(8):1557-72. doi: 10.1002/pmic.200900646. [PubMed: 20186752]. 13. Gao P, Bai X, Yang L, Lv D, Li Y, Cai H, et al. Over-expression of osa-MIR396c decreases salt and alkali stress tolerance. Planta. 2010;231(5):991-1001. doi: 10.1007/s00425-010-1104-2. [PubMed: 20135324]. 14. Zhang X, Xu J, Wang J, Gortner L, Zhang S, Wei X, et al. Reduction of microRNA-206 contributes to the development of bronchopulmonary dysplasia through up-regulation of fibronectin 1. PLoS One. 2013;8(9). e74750. doi: 10.1371/journal.pone.0074750. [PubMed: 24040336]. [PubMed Central: PMC3769311]. 15. Rochefort GY, Delorme B, Lopez A, Herault O, Bonnet P, Charbord P, et al. Multipotential mesenchymal stem cells are mobilized into peripheral blood by hypoxia. Stem Cells. 2006;24(10):2202-8. doi: 10.1634/stemcells.2006-0164. [PubMed: 16778152]. 16. Zhang X, Liu S, Hu T, Liu S, He Y, Sun S. Up-regulated microRNA-143 transcribed by nuclear factor kappa B enhances hepatocarcinoma metastasis by repressing fibronectin expression. Hepatology. 2009;50(2):490-9. doi: 10.1002/hep.23008. [PubMed: 19472311]. 17. Zhang X, Peng W, Zhang S, Wang C, He X, Zhang Z, et al. MicroRNA expression profile in hyperoxia-exposed newborn mice during the development of bronchopulmonary dysplasia. Respir Care. 2011;56(7):1009-15. doi: 10.4187/respcare.01032. [PubMed: 21310116]. 18. Wang XW, Xi XQ, Wu J, Wan YY, Hui HX, Cao XF. MicroRNA-206 attenuates tumor proliferation and migration involving the downregulation of NOTCH3 in colorectal cancer. Oncol Rep. 2015;33(3):1402-10. doi: 10.3892/or.2015.3731. [PubMed: 25607234]. 19. Zhang C, Yao C, Li H, Wang G, He X. Serum levels of microRNA-133b and microRNA-206 expression predict prognosis in patients with osteosarcoma. Int J Clin Exp Pathol. 2014;7(7):4194-203. [PubMed: 25120799]. [PubMed Central: PMC4129034]. 20. Ren J, Huang HJ, Gong Y, Yue S, Tang LM, Cheng SY. MicroRNA-206 suppresses gastric cancer cell growth and metastasis. Cell Biosci. 2014;4:26. doi: 10.1186/2045-3701-4-26. [PubMed: 24855559]. [PubMed Central: PMC4030529]. 21. Mataki H, Seki N, Chiyomaru T, Enokida H, Goto Y, Kumamoto T, et al. Tumor-suppressive microRNA-206 as a dual inhibitor of MET and EGFR oncogenic signaling in lung squamous cell carcinoma. Int J Oncol. 2015;46(3):1039-50. doi: 10.3892/ijo.2014.2802. [PubMed: 25522678]. 22. Yang Q, Zhang C, Huang B, Li H, Zhang R, Huang Y, et al. Downregulation of microRNA-206 is a potent prognostic marker for patients with gastric cancer. Eur J Gastroenterol Hepatol. 2013;25(8):953-7. doi: 10.1097/MEG.0b013e32835ed691. [PubMed: 23751352]. 23. Zhang H, Guo Y, Mishra A, Gou D, Chintagari NR, Liu L. MicroRNA-206 regulates surfactant secretion by targeting VAMP-2. FEBS Lett. 2015;589(1):172-6. doi: 10.1016/j.febslet.2014.11.043. [PubMed: 25481410]. [PubMed Central: PMC4281256]. 24. Hallman M. The surfactant system protects both fetus and newborn. Neonatology. 2013;103(4):320-6. doi: 10.1159/000349994. [PubMed: 23736009]. 25. Fujiu K, Manabe I, Nagai R. Renal collecting duct epithelial cells regulate inflammation in tubulointerstitial damage in mice. J Clin Invest. 2011;121(9):3425-41. doi: 10.1172/JCI57582. [PubMed: 21821915]. [PubMed Central: PMC3163964]. 26. Lumeng CN, Deyoung SM, Bodzin JL, Saltiel AR. Increased inflammatory properties of adipose tissue macrophages recruited during diet-induced obesity. Diabetes. 2007;56(1):16-23. doi: 10.2337/db06-1076. [PubMed: 17192460]. 27. Kallapur SG, Jobe AH. Contribution of inflammation to lung injury and development. Arch Dis Child Fetal Neonatal Ed. 2006;91(2):F132-5. doi: 10.1136/adc.2004.068544. [PubMed: 16492951]. [PubMed Central: PMC2672671]. 28. McAdams RM, Vanderhoeven J, Beyer RP, Bammler TK, Farin FM, Liggitt HD, et al. Choriodecidual infection downregulates angiogenesis and morphogenesis pathways in fetal lungs from Macaca nemestrina. PLoS One. 2012;7(10). e46863. doi: 10.1371/journal.pone.0046863. [PubMed: 23056493]. [PubMed Central: PMC3467273]. 29. Sureshbabu A, Syed MA, Boddupalli CS, Dhodapkar MV, Homer RJ, Minoo P, et al. Conditional overexpression of TGFβ1 promotes pulmonary inflammation, apoptosis and mortality via TGFβR2 in the developing mouse lung. Resp Res. 2015;16(1):4. doi: 10.1186/s12931-014-0162-6. 30. Tian XY, Zhang XD, Li QL, Shen Y, Zheng J. Biological markers in cord blood for prediction of bronchopulmonary dysplasia in premature infants. Clin Exp Obstet Gynecol. 2014;41(3):313-8. [PubMed: 24992784].